The 2012 edition of NASBA's Candidate Performance on the Uniform CPA Examination: Reports and Commentary on the 2011 CPA Examination became available during the first quarter of 2012, thanks to the use of new technologies that made tracking and tabulating the data more efficient. Appendices cover both summary and section performance by institution attended, broken down to show the performance by all candidates taking a section, by those taking it for the first time and by level of education. The report is available in an eBook format for $100 and in a paperback version for $120. In addition, by special request, standard on-line reports and customized reports can also be produced. 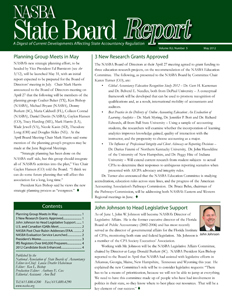 Questions about the report should be sent to cpb@nasba.org. Orders can be placed through NASBA's website.